This weather crypto-family list of words engages students' brains, drawing upon knowledge of theme based words, letter patterns and word structures. Start with letter hint by substituting the letter |E| with the letter |T|. Next, brainstorm weather related words, either independently or in a group, to support solving the puzzle. Then, using knowledge of how words are structure with different letter patterns, decipher the encoded list to discover the vocabulary. Crypto-family lists of puzzles can augment language programs in regular classrooms and homeschooling environments. 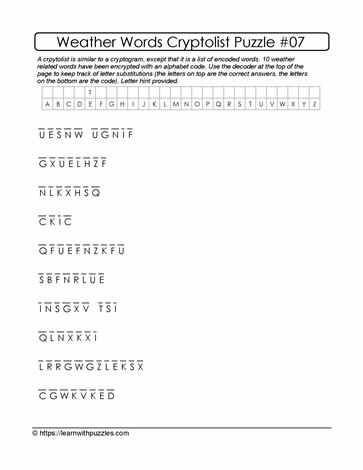 Add cryptolist puzzles to the Resource Kit for Tutors.